Treating swelling due to congestive heart failure, liver problems, and severe kidney problems. 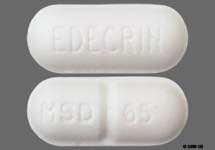 Edecrin is a loop diuretic. It works by making the kidneys eliminate larger amounts of electrolytes (especially sodium and potassium salts) and water than normal (diuretic effect). It is useful for treating many conditions in which salt and water retention (eg, edema, swelling) is a problem. Intravenous SODIUM EDECRIN (Ethacrynate Sodium) is indicated when a rapid onset of diuresis is desired -- for example, in acute pulmonary edema, or when gastrointestinal absorption is impaired or oral medication is not practical. Onset of action with either formulation is rapid, usually within 30 minutes after an oral dose of EDECRIN or within 5 minutes after an intravenous injection of SODIUM EDECRIN. After oral use, diuresis peaks in about 2 hours and lasts about 6 to 8 hours. Ethacrynic acid is a "water pill" (diuretic) that increases the amount of urine you make. This helps your body get rid of extra water. This medication decreases swelling/fluid retention (edema) caused by conditions such as cancer, congestive heart failure, liver disease, and kidney disease. This effect can help improve symptoms such as trouble breathing and swollen belly (ascites) and improve kidney function. This medication should not be used in infants. USES: Ethacrynic acid is a "water pill" (diuretic) that is used to decrease the amount of water in the body by increasing urination. It is used to decrease body fluid and swelling of the hands or feet (edema), and for high blood pressure. HOW TO USE: Take as directed with food or milk if this drug causes stomach upset. If this medication is used in the late afternoon or evening, you may need to urinate during the night. Consult your doctor regarding your dosing schedule. SIDE EFFECTS: This drug may cause dizziness and lightheadedness especially during the first few days as your body adjusts to it. Rise slowly from a seated or lying position. Blurred vision, loss of appetite, itching, stomach upset, headache and weakness may also occur during initial therapy as your body adjusts to the medication.